Are you considering buying a timeshare in South Carolina? Did you already sign the timeshare contract and you’re now having second thoughts? Have you stopped making payments on your timeshare in South Carolina and want to know what the consequences will be? Regardless of the answer to the above questions, the following information has been assembled for you to help you understand your options for canceling a timeshare contract in South Carolina. According to South Carolina timeshare laws, there are certain buyers’ protection measures in place to protect your rights. How do I Cancel a Timeshare Contract in South Carolina? South Carolina timeshare legislation (S.C. Code Ann. § 27-32-40) allows timeshare buyers to officially cancel the timeshare contract only if it is done so within 5 days from the date the contract was signed or the date the buyer receives the Disclosure Agreement, which ever occurs later. This does not include Sunday if that happens to be the 5th day. Of course, this Notice of Timeshare Contract Cancellation must be submitted in writing. Another consumer protection measure available for canceling a South Carolina timeshare contract is the right to cancel a timeshare contract if and when the timeshare is rendered unavailable as specified in the original timeshare contract. Therefore, if the timeshare company does not offer you comparable accommodations to what you originally agreed to in the contract in the event of unavailability, you may cancel your timeshare contract in South Carolina (S.C. Code Ann. § 27-32-40). Can I Get a Refund after Canceling a Timeshare Contract in South Carolina? Yes, you are entitled to a refund if you have submitted your written Notice of Cancellation within the above timeframe. According to (S.C. Code Ann. § 27-32-60), the timeshare company is required to issue a refund for the original payment you made within 20 days after they received your Notice of Cancellation. The only stipulation is that you have not received benefits prior to submitting your cancellation notice. If you have received any benefits, the timeshare seller must refund your payment less the amount in accordance with the benefits you enjoyed within 30 days of receipt of your cancellation notice. Is There a List of Legal Disclosures Required in the Purchase of a Timeshare? Each timeshare buyer in the State of South Carolina has to be supplied with a Disclosure Document detailing the various Terms and Conditions of the Vacation Timeshare Program (S.C. Code Ann. § 27-32-405). The timeshare seller’s name and address. Short description of the timeshare property that is offered to the buyer in the timeshare program. The conditions and terms whereby charges may be added or changed, as well as the name of the person who would be given the right to make those changes. An explanation of how the timeshare buyer will be protected in the case of loss resulting from foreclosure incurred due to the timeshare company’s financial obligations. Verbiage explaining that the timeshare buyer should only purchase the timeshare for personal enjoyment and usage, not for investment, resale or rental purposes. What are the South Carolina Timeshare Sale Laws? Because the timeshare sales sector is rife with corruption and dishonest sales tactics, South Carolina legislation (S.C. Code Ann. § 27-32-110) has been put in place to combat ruthless salespeople. Timeshare company salespeople are prohibited from putting forth misleading or false information for advertising or selling purposes. What is the South Carolina Timeshare Foreclosure Procedure? Those who purchase a deeded timeshare property by taking out a mortgage loan and subsequently default on their loan payments will be subject to foreclosure proceedings in the State of South Carolina. Likewise, timeshare owners are normally obligated to pay fees for maintenance, assessments, utility payments and associated taxes. Although residential foreclosure is a judicial matter in South Carolina, special laws provide for non-judicial foreclosure proceedings for timeshare mortgage loans and liens due to unpaid assessments (S.C. Code Ann. § 27-32-325). Are there Any South Carolina Timeshare Deficiency Judgments? When a loan provider forecloses on a timeshare mortgage, the amount of the debt owed by the timeshare owner to the lender can be more than the final price of the foreclosure sale. If there is a difference between the owed amount and the final selling price, the resulting figure is termed the “deficiency.” South Carolina timeshare law does not hold the timeshare owner/mortgage borrower is not held liable for deficiency judgment regardless of if the proceeds of the sale cover the original debt or not (S.C. Code Ann. § 27-32-320). 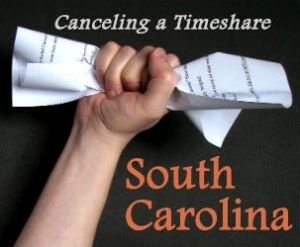 Too Late to Cancel a Timeshare in South Carolina? If canceling a timeshare contract in South Carolina is no longer an option for you according to the Timeshare Laws of South Carolina, call us now for a Free Consultation. Redemption and Release, LLC can make your South Carolina timeshare cancellation exit strategy simple and cost-effective. Contact us today at 1-888-743-9051 or use our Online Contact Form to request free, no-obligation information about canceling a timeshare contract in South Carolina.